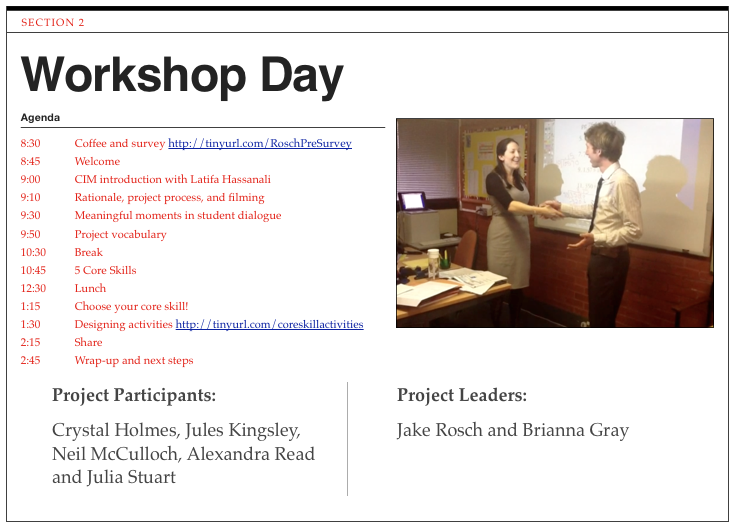 The project leaders have designed a one-day workshop for faculty members of any grade level or subject area who may be interested in enhancing their curricula with student dialogue activities. The day includes two parts: a morning session dedicated to introducing the research and rationale behind increasing student-to-student dialogue, as well as the opportunity to participate in core skill activities based on Zwiers and Crawford's (2011) "Five Core Skills for Academic Conversation"; and an afternoon session for the collaborative development of new core skill activities to be integrated into each teacher’s classes. 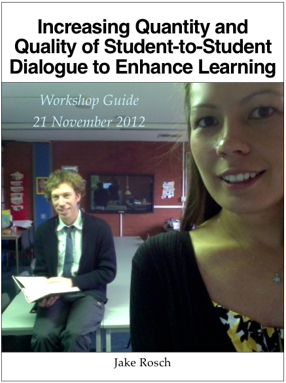 A foundation for further participation in the Talking in Class student dialogue project. This includes the option of fully exploring the process of prediction/implementation/reflection, using video as a means of evaluation of teaching practice, aligned with Domain 4 of the Danielson Framework. Sample workshop schedule - the day begins and ends with participant feedback to determine individual needs. Project participants download the Workshop Guide iBook, providing an outline of the research and the day’s activities, prior to attending. The TALKING IN CLASS workshop is available for educators of any subject or grade level. If you would like to learn more about bringing this professional development opportunity to your school, please contact Jake and Brianna.